A few months ago, I was offered a free copy of The Secret of the Sacred Scarab by Fiona Ingram. In exchange, I agreed to post a review of the book on my blog. Below you will read a completely honest review by my twelve year old son, T. He really enjoyed reading this book and was happy to write a review. I have not read the book myself, but T has convinced me that I should read it soon. If you are interested in learning more about the book, check out the website www.secretofthesacredscarab.com. 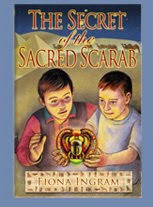 The Secret of the Sacred Scarab is about two boys, Justin and Adam, who are very excited to finally go on a trip to Egypt with their aunt and grandmother. When they get there, they run into a peddler who begs and asks if they are English. They finally tell him, and the peddler drops three scarabs in Adam's hand as he runs away. He also sneaks something into Adam's pocket without Adam's knowledge. What they don't know is that this secret will only lead to more trouble as the story develops. My favorite part of the book is when Adam and Justin, along with some people they become friends with on the adventure, are led by the villain of the story to the Scarab King's tomb. The book has many exciting and surprising twists. I think most people would like this book, and I recommend it to anyone looking for an exciting, action packed story that will keep you on the edge of your seat wondering what will happen next. Even if you are not a person who likes books, this is a great book that will inspire a love of books! thanks T i will be getting it for Froggi i really think she will like it! I love how you had him do his own post for this review. He did a great job! I meant to say, this may even be a book Hanna likes seeing there is a tomb involved, she loves tombs--weird isn't it? He wrote a great review, gave us information without giving away the plot of the book (even I'm not good at that). T did a great job on his review! I am the author of The Secret of the Sacred Scarab and I am so honored you read and reviewed my book. I am also really happy you liked my book, which is obviously the most important part of any review. Susana: please tell Hanna there is a fantastic tomb in the book, and I think she'll love this one if she is keen on tombs! Hello from our new kitchen!